On Saturday at the Associated Press, aka the Administration's Press, reporter Christopher Rugaber described the economy's pickup of 321,000 payroll jobs in November as "booming." Even if you accept that November's seasonally adjusted result fairly reflects the underlying reality — and it doesn't, which will be shown shortly — it will only be "booming" once we see such a figure repeated for at least five more months. On a workforce-adjusted basis, the analogous post-recession period during Ronald Reagan's presidency in the 1980s had a streak of 19 out of 20 months with an equal or better performance than just seen in November while averaging 323,000 monthly job additions over 65 months. Monthly job growth during the Obama administration's 65-month faux recovery has averaged only 140,000. 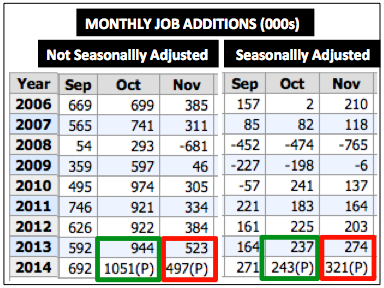 As seen in the red boxes, BLS currently estimates that the economy really added 497,000 jobs in November. That's 26,000 fewer than were added in November 2013. Yet somehow, after seasonal adjustment, November 2014 came in 47,000 jobs higher than the same month last year. A more reasonable seasonally adjusted result in Friday's report would have been in the neighborhood of 250,000 — far from awful, but definitely not "booming." By contrast, as seen in the green boxes, October's seasonally adjusted result understated that month's strength. Before adjusting for workforce size, the 1.051 million in estimated job additions that month is the best result since the government began monthly recordkeeping in 1939, and is 107,000 jobs greater than November 2013. October is the month which should have seen a seasonally adjusted result well above 300,000; instead, it was barely better than October 2013. In normal times, it’s usually acceptable for data users to stick with seasonally adjusted (SA) information while avoiding the adventure of delving into and analyzing the raw, not seasonally adjusted stuff. But these are not normal times. ... In abnormal times such as these, you cannot be sure that the SA data adequately reflects what’s happening in the raw information. To be clear, I'm not alleging that the BLS is deliberately engaging in deception in its Establishment Survey of employers — yet. But the agency knows how misleading its official adjusted data have often been, and has done next to nothing to alert the public to the problem. Meanwhile, reporters in the business press, most of whom know better, still treat the adjusted numbers as gospel while barely acknowledging the raw numbers' existence. Thus, the public has every reason to believe that November was a great month in the job market, while October was lukewarm. The reality is exactly the opposite — which should be leading people to wonder if economic conditions might once again be deteriorating.